Reaffirming once again that you should always try to make ridiculous bets with your favorite celebrities, David Harbour made good on a Twitter wager he placed in October. The Stranger Things star promised to stop by for a yearbook photo cameo if a particular California high-school student, identified as Damaris Fregoso on her Instagram, succeeded in getting her request retweeted 25,000 times. Behold, one young woman’s dreams come true! 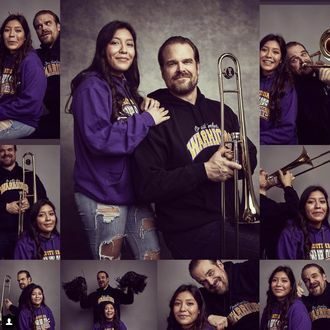 Plus the dreams of her family members, who ostensibly also dreamed of meeting David Harbour. Sure, maybe Damaris didn’t dream the whole “he actually tries to play trombone” part, but apparently he didn’t do too badly with that either. Well this is certainly something I didn't think would actually happen! David is such a sweet dude! Even my 5 month old nephew got in on the action, haha! Can't wait to share the photos soon!!! "look into the bright future damaris.. what do you see? "- david. many more photos to come but i can't thank @iamtommyg enough, i love the photos w/ everything in me!! !